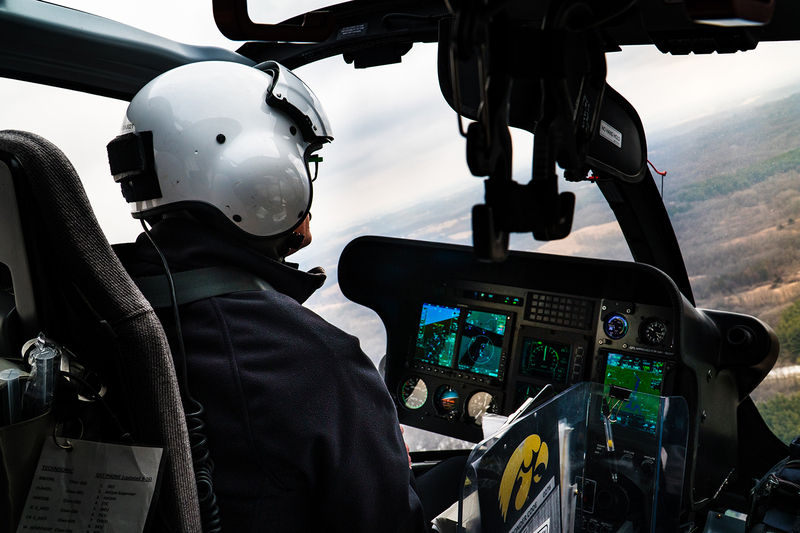 AirCare Lead Pilot Tim Whaylen flies the AirCare helicopter on March 20, 2019 over Iowa City, Iowa. The University of Iowa Hospitals & Clinics' AirCare team takes around 800 flights a year. The average time from receiving a call to getting off the ground? Seven minutes. The rotor starts up as Tim Whaylen sits at the controls in the cockpit, pushing buttons and flipping switches. The blades start to turn. Whaylen, the lead pilot on the AirCare team at the University of Iowa Hospitals & Clinics, speaks to someone from flight control before he prepares the black and gold helicopter for takeoff. AirCare lead pilot Tim Whaylen preps the helicopter for take off on March 20, 2019. The helicopter starts to levitate. Prominent Iowa City landmarks begin to shrink: the Old Capitol, the Stead Family Children’s Hospital, and Kinnick Stadium all quickly transmogrify into toy models. 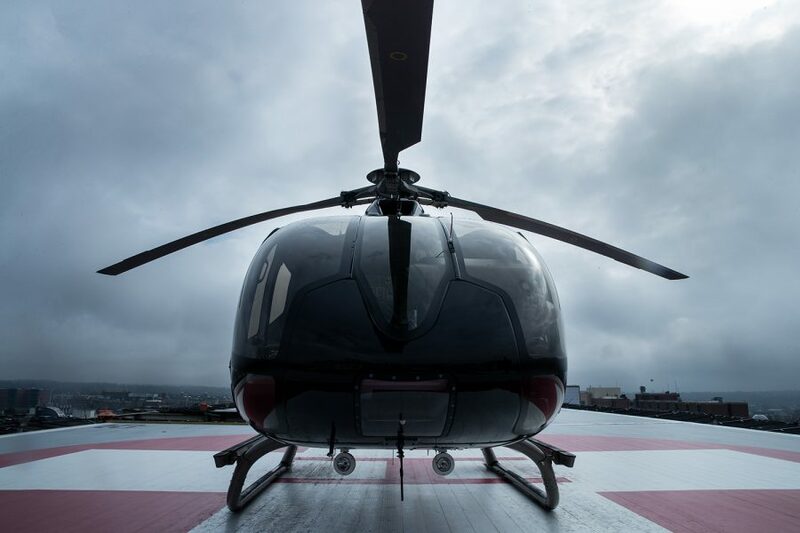 This emergency helicopter is the fulcrum of AirCare. The team consists of almost 30 individuals, from pilots and mechanics to nurses and paramedics whose daily job it is to save lives that require transport by air. Daily Iowan reporters accompanied two staffers on a ride to get a sense of their daily perspective from the skies. AirCare was established in 1979 and was the state’s first “air ambulance,” with three bases in Waterloo, Dubuque, and Iowa City. The fleet includes three helicopters and recently added an airplane. 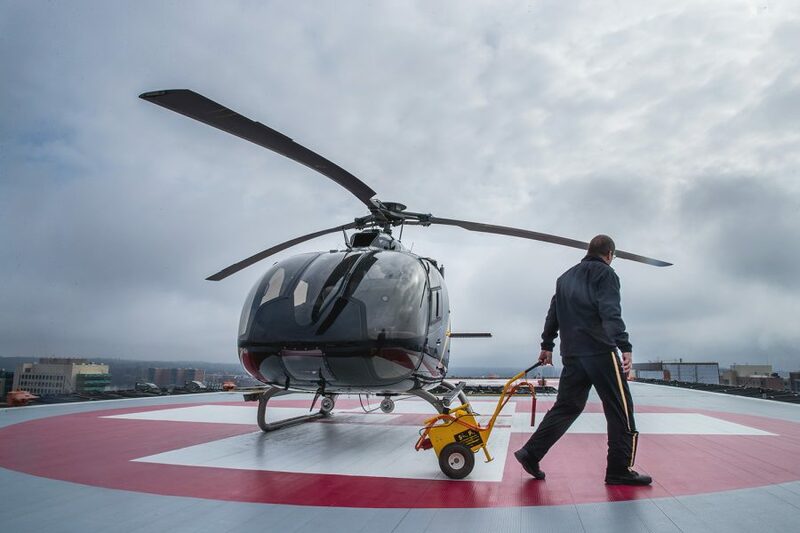 Part of AirCare’s mission is to rapidly and safely transport high-risk and complex patients, from victims of trauma who may have suffered a serious motor-vehicle accident to critically ill newborns born prematurely. The average time from receiving a call to getting off the ground? Seven minutes. The program takes around 800 flights a year and transports all ages, including neonatal and pediatric patients. Since its establishment, AirCare has transported almost 35,000 patients. AirCare also has neonatal and pediatric nurses on flight staff. UIHC’s medical air-transport partner, Air Methods, owns and operates the aircraft. The Colorado-based private company is responsible for hiring and paying the pilots and handling operational costs. UIHC employs the medical staff who travel along with the pilots. In the cockpit, Whaylen explains that the helicopter is very agile and could rotate completely over if he wanted it to. He said the rule of thumb is to not tilt the aircraft past 30 degrees to keep a smooth ride. The 58-year-old pilot was born and raised in Granite Falls, Minnesota, and started flying helicopters in 1982 during his time in the Army. After leaving the Army, Whaylen flew for emergency medical services in Minnesota before heading to Iowa City four years ago. 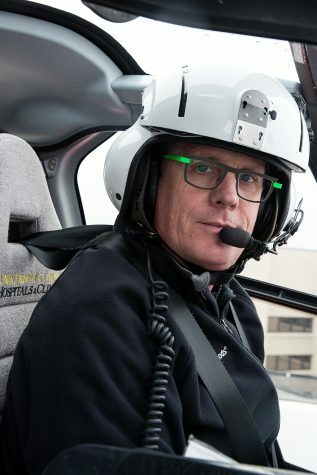 AirCare Lead Pilot Tim Whaylen poses for a portrait in a helicopter on the roof of the hospital on March 20, 2019 in Iowa City, Iowa. Whaylen knew he wanted to keep flying and helping people while doing it. He knew he didn’t want to be stuck in a routine. “The great thing about EMS is you never know what your day is going to hold,” he said. Pilots report to the hospital an hour earlier than the nurses and paramedics. Whaylen arrives at work, pulls up the weather on his monitor, and looks at notices to airmen posted about daily cautions and flight-navigational risks. After that, he checks the helicopter and conducts a preflight, making sure the aircraft is ready to fly. Next is the daily briefing at 7 a.m., when the rest of the staff arrives. “We discuss the weather, any maintenance, any training, the status of our night-vision goggles, anything relevant to the day,” he said. “We usually have a daily safety topic that we discuss. Then once we are done with that, we start waiting. 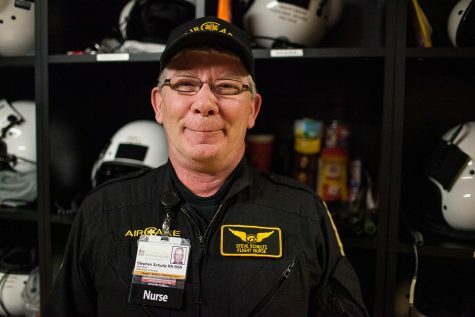 Steve Schultz, a flight nurse with AirCare, agreed that there is no standard day on the ninth floor of the hospital, where AirCare is stationed. Flight nurse Steve Schultz poses in front of his snack stash in the UIHC on March 29, 2019. Schultz grew up in Cedar Rapids and has been at UIHC since 1995. He started flying with AirCare in 2000. While nurses and paramedics don’t have a role in controlling the aircraft, they do assist in watching for potential obstacles. Schultz became interested in the medical field when he was in high school. When a tornado hit Iowa City in April 2006, Schultz was part of an AirCare team coming back from Clinton, Iowa, with a patient on board. With the weather becoming increasingly dangerous and the wind speed picking up, the team had to make a choice. While Schultz is a veteran member of the team, others have recently joined AirCare. Caroline Maliske, a neonatal/pediatric flight nurse, has only been a part of the team for around eight months. She works with infants, most of them premature. Growing up in Minneapolis, Maliske volunteered in a children’s hospital and said being a nurse always seemed like a good fit for her. 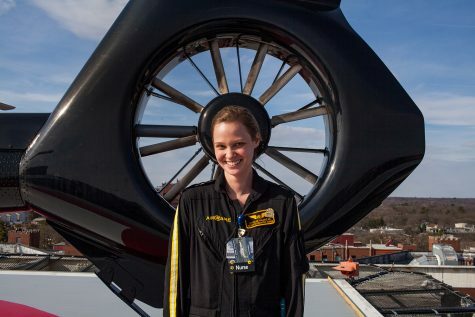 Pediatric flight nurse Caroline Maliske poses in front of the AirCare helicopter on top of the UIHC helipad on March 29, 2019. The neonatal/pediatric flight nurses also make rounds in the Stead Family Children’s Hospital. They assist with IVs or procedures. Maliske said as a nurse, she gets to be independent in making decisions. Not every transport has a happy ending, and this dire reality is one of the most challenging aspects of the job, said almost every member of the team. Maliske said that the happy endings are what make the job worth it. An AirCare helicopter on the roof of the hospital on March 20, 2019 in Iowa City, Iowa. Kirsten Jordan, another neonatal/pediatric flight nurse from Omaha, is the newest nurse who joined the team in August. Prior to being in AirCare, she was in the pediatric intensive care unit as well as the neonatal ICU. She said she put the two aspects of those jobs together when she joined AirCare. Jordan said she has found her calling on the AirCare team. Jordan said she also gets the chance to help with deliveries at the hospital in her AirCare role. Flight paramedic Christian Swangel said working for AirCare is everything he has wanted to do since his days as a volunteer fireman and EMT. Now 49 years old, he is doing what he loves. Video: AirCare lead pilot Tim Whaylen talks about his experience flying EMS. Lead pilot Whaylen has seen a lot of trauma and sickness in his 27 years flying EMS. He said he has experienced many interesting flights, but he also remembers the tragic ones. One moment Whaylen distinctively recalls inspiring one patient in need of care to become a caretaker herself. Whaylen was in flight from Duluth, Minnesota, to Cedar Rapids, dropping a patient off and heading back when he received another dispatch. “They asked if we had enough fuel to go back to this little town to pick up a girl who was helping her dad process a deer and got her hand stuck in a grinder,” he said. Whaylen flew the girl to the hospital, the grinder still attached to her arm because staff was hoping to save her elbow. This was a memorable case — but Whaylen later discovered what happened to that young girl. Years later, he was flying with a young paramedic, and as he shared the story, the paramedic’s mouth gaped open. 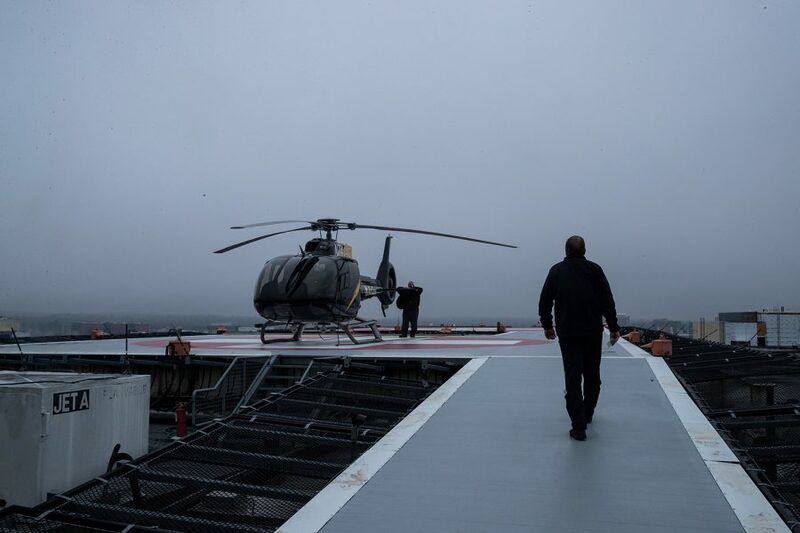 Lead Pilot Tim Whaylen at the UIHC AirCare unit walks towards the helicopter on the roof of the hospital on March 20, 2019 in Iowa City, Iowa. After the helicopter lands back on the UIHC’s helipad, Whaylen shuts down the aircraft, and he and nurse Schultz take off their headgear and step out. They start heading down the ramp toward the AirCare office ready for whatever comes their way the rest of the day. Photos: Fly through the air see photos of Iowa City from the sky. An AirCare helicopter sits on the roof of UIHC on March 20, 2019 in Iowa City, Iowa.